There has been a lot of discussion of America’s gun laws and culture recently after the school shooting in Conneticut. The danger of gun prevalence in the USA really hit home, though, as I was reading a book over Christmas. I’ve been reading Armin Brott’s excellent ‘The New Father: A Dad’s Guide to the First Year’, and then Sally kindly bought me the follow-up book that covers years two and three. 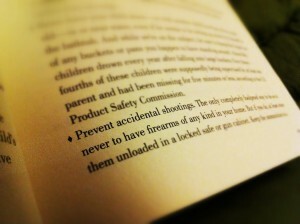 Prevent accidental shootings. The only completely foolproof way to do so is never to have firearms of any kind in your home. As we head into 2013 with a highly mobile and intensely curious toddler, I’m very glad that I live in a country where such deadly objects are so hard to come by.